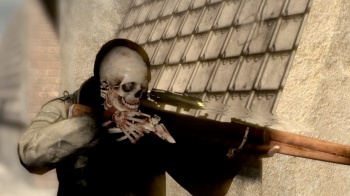 Sniper Elite 3 is officially in development and before you ask, yes, the hilariously horrific X-ray Kill Cam will return. When developer Rebellion and publisher 505 Games released Sniper Elite V2 on April 30, 2012, it was hyped as an ultra-realistic simulation of what sharpshooters went through during World War II. It didn't exactly live up to those expectations -- we doubt many snipers single-handedly took out entire wings of the Third Reich like an anachronistic Solid Snake -- and it was a bit rough around the edges, but it did one key thing very, very well: Virtual assassinations. It was apparent that Rebellion focused its development efforts on the game's sniping engine to the detriment of everything else, but that sniping engine was so visceral that we don't mind much. Lining up the perfect headshot, holding your breath and slowly squeezing the trigger was a tense experience only matched by the satisfying death you could unleash. Particularly excellent shots caused enemies to be rendered in skeletal detail, offering players the chance to watch as their ammunition splintered skulls, shattered ribs and turned internal organs into slushy, bloody stew. It was gory in the extreme, but your targets were Nazis. They had it coming. With that in mind, it should come as no surprise that we're very excited to hear that Rebellion and 505 Games are once again joining forces to create Sniper Elite 3. Little is known of the game's story, save that it continues the adventures of Karl Fairburne during World War II. The game's official logo features the word "Afrika," leading us to suspect that Sniper Elite 3 will take place in the hotly contested Northern African front, but otherwise the plot is a mystery. And how is the sniping engine? According to this morning's announcement, it's even better than that seen in Sniper Elite V2. "Sniper Elite V2 was just the beginning of what we want to do with the franchise, there are things we didn't have time to do before that we can really look at featuring this time," said Rebellion CEO Jason Kingsley. "We want to focus on making this latest incarnation of Sniper Elite more of a sandbox game and also build on the awesome X-Ray Kill Cam and the atmospheric World War II setting." Intriguingly, the announcement offers no official word on which platforms Sniper Elite 3 might appear on. Instead, it simply states that the game is being "developed for current and next gen platforms as well as PC." A sandbox game, with an improved X-Ray Kill Cam, set amidst the geographically diverse, political hotbed that was Northern Africa circa World War II? That's got a lot of potential as a premise. Hopefully the success of Sniper Elite V2 will give Rebellion the resources necessary to flesh out the franchise beyond its current status as an excellent simulation of killing jerks at extremely long range. Then again, even if it doesn't, Sniper Elite 3 should still offer an entertaining action game experience for those who prefer stealth and subterfuge over running into combat with guns blazing.